Farm Tractor Cut and Paste Craft Activity! Learn shapes and fine motor skills! 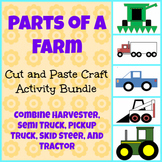 Farm Cut and Paste Craft Activity Bundle! Practice shapes and fine motor skills! Animal Coloring Pages / Book. Unique World Animals!